Bold green signs are coming to the Provo River Parkway Trail soon, making it easy for cyclists and pedestrians to navigate their way from the trail to the surrounding streets. In early January, the Provo Bicycle Committee asked Parks & Rec if signs could be created. 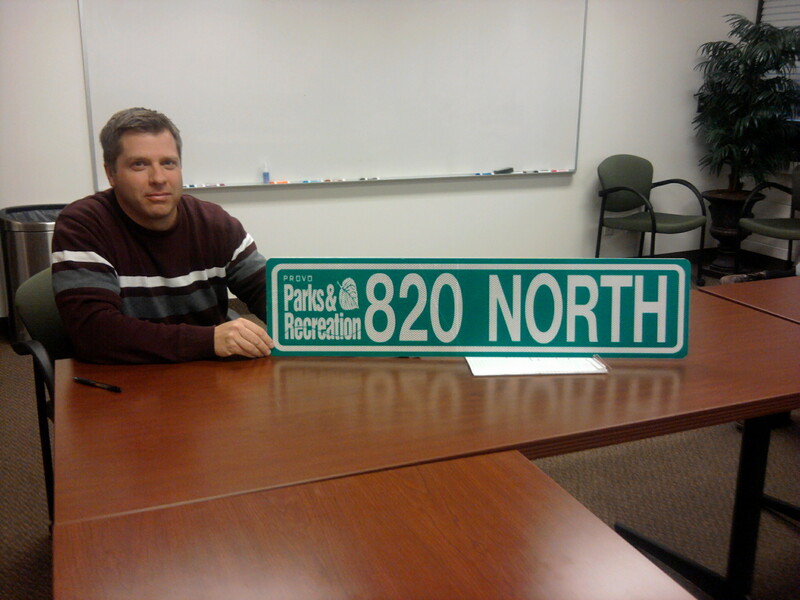 Just two weeks later, Doug came to the next committee meeting with the first sign already created! Whoohoo! The new Provo River Trail signs will let riders know what streets they are crossing. This will make it easier and safer for cyclists to use the trail for transportation. In case of emergency, trail users will be able to more easily identify their location and tell 911 operators where they are. Thanks, Provo Parks and Rec! This entry was posted in Bike Advocacy, Bike Paths, Provo Bicycle Projects, Provo Bike Committee by Jamie. Bookmark the permalink.